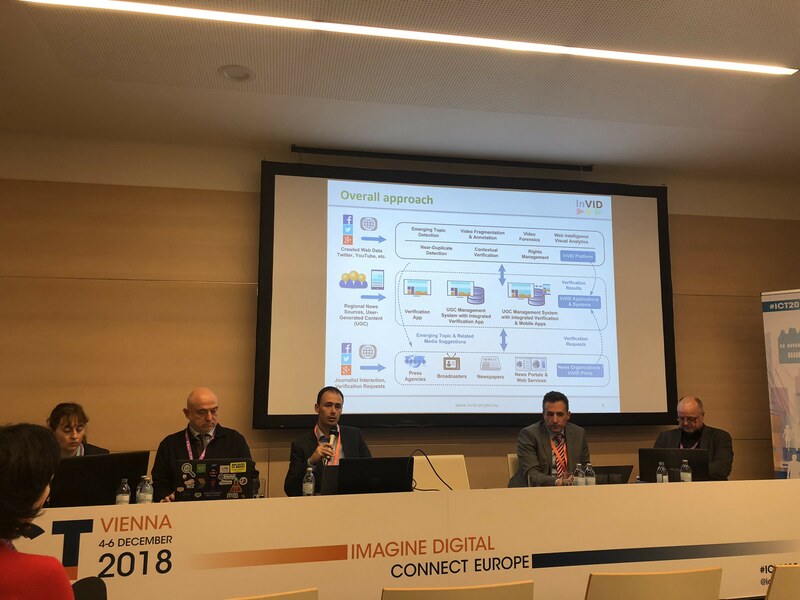 As it was one of the final dissemination events of the InVID project, and a rather successful one, we portray what happened at ICT 2018 in Vienna in more detail here to give the reader an impression of one of the project’s final dissemination activities. 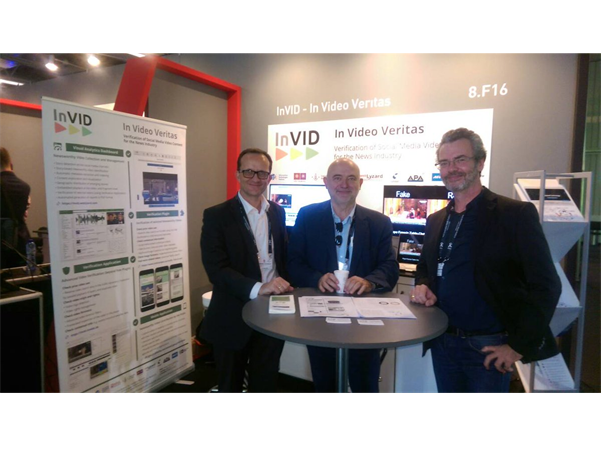 InVID was represented at ICT 2018 with a stand / booth that was manned over the entire three days of the conference and exhibition. 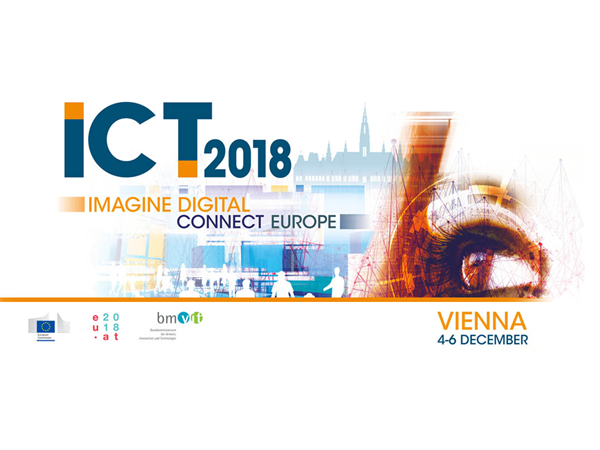 ICT 2018 took place from 4 – 6 December 2018 in the Austrian capital Vienna. 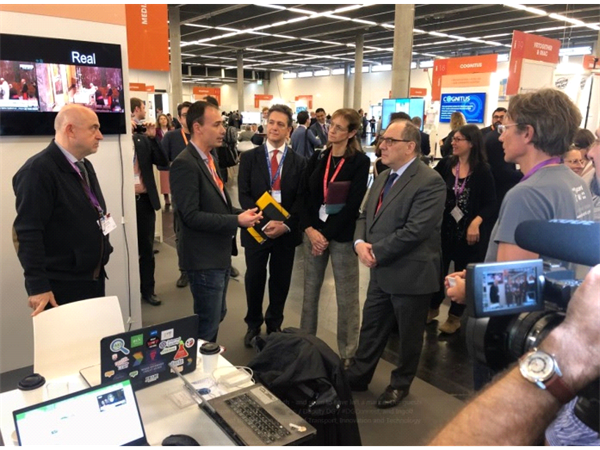 Many people stopped by our stand, including – among others – Claire Bury from the EU Commission, Deputy Director General at DG Connect, and Ingolf Schädler, Deputy Director General at the Austrian Ministry of Transport, Innovation and Technology. A photo of the InVID project co-ordinator, Dr. Vasileios Mezaris, talking to a group of high-profile visitors appears on the top of this article (photo taken by Jochen Spangenberg). In addition to our continuous stand presence in Hall X3, we hosted a networking session on day 2 of the conference (Wednesday, 5 December 2018). 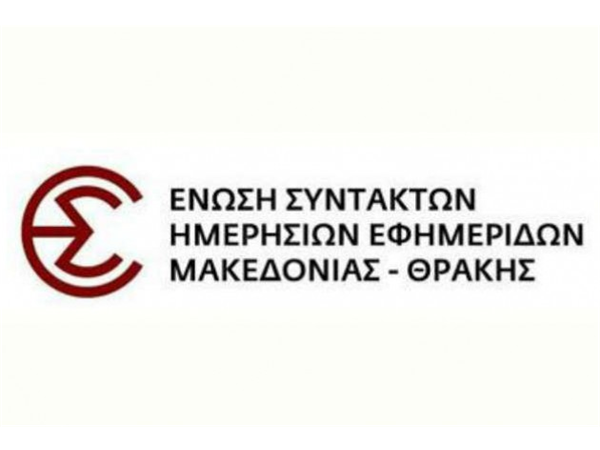 The session was organised by CERTH’s Symeon Papadopoulos and featured contributions – in order of appearance – by Vasileios Mezaris (CERTH), Denis Teyssou (AFP), Jochen Spangenberg (Deutsche Welle), Nikos Sarris (Athens Technology Center) and Zlatina Marinova (Ontotext). 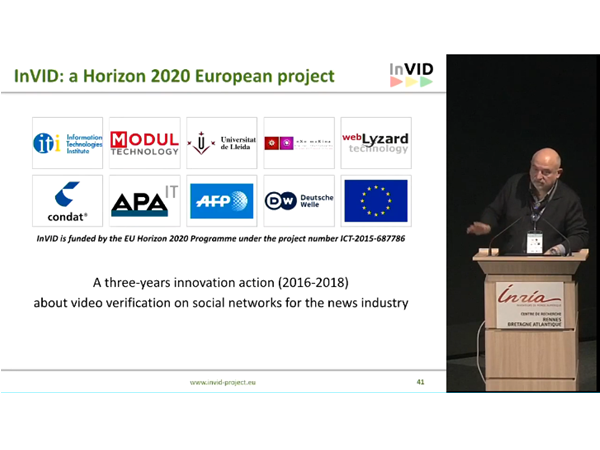 The topic of the lively presentations and discussions: “Fighting Disinformation through Human, Crowd and Artificial Intelligence.” Presentations dealt with InVID project outcomes, work of the (now completed) EU project REVEAL (one of the EC’s very first projects dealing with verification of digital content – started in 2013 and completed in late 2016. 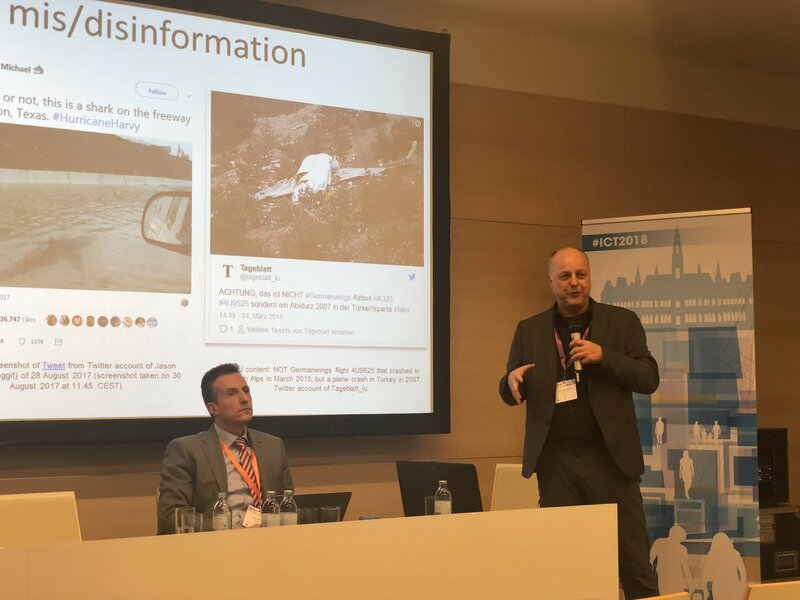 More on https://revealproject.eu/), Truly Media (a collaborative verification platform developed by ATC and Deutsche Welle – more on http://www.truly.media/), and the newly started EU projects WeVerify (also tackling misinformation – started on 1 Dec 2018, more on https://weverify.eu/) and the coordination action SOMA (building and supporting a European Disinformation Observatory – more on http://www.disinfobservatory.org/). The InVID team itself reported very actively about its presence and activities. 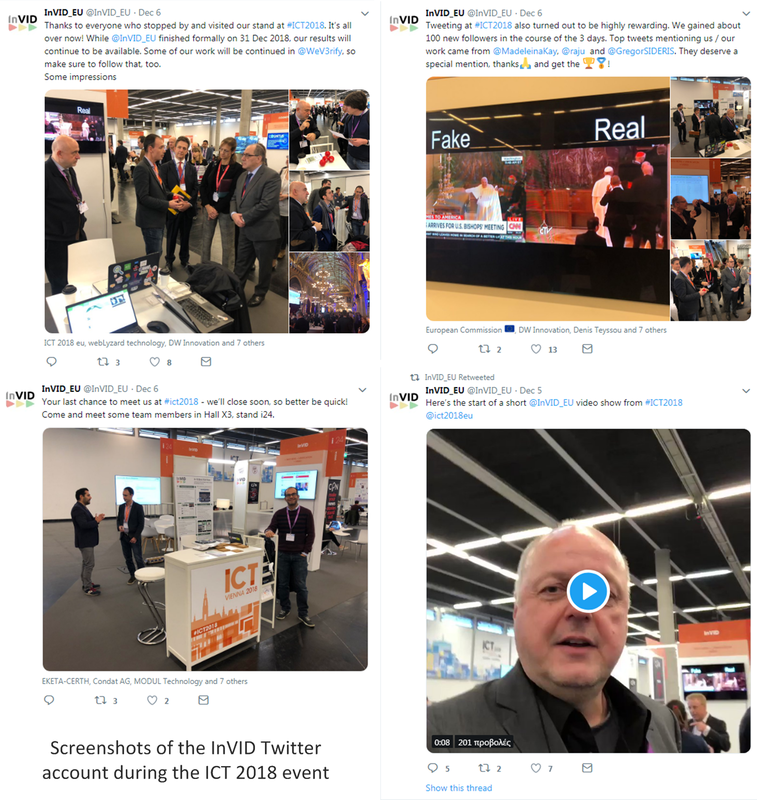 We produced short videos with most project members present, in which they outlined project outcomes, results and achievements, and used Twitter as our primary channel to report about our activities and what was going on. Our own efforts were supported greatly by others reporting and tweeting about us and what we got up to. Below, we provide screenshots of the tweets that gained most attention and interactions. feedback obtained was highly positive and came from a great variety of stakeholders and interested parties. 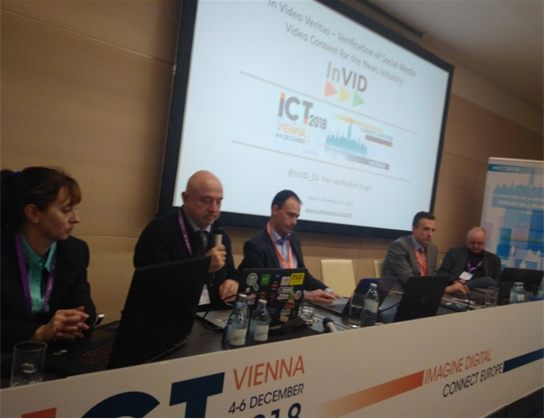 Summing up, the InVID presence at ICT 2018 in Vienna can be called a high profile event with considerable impact. 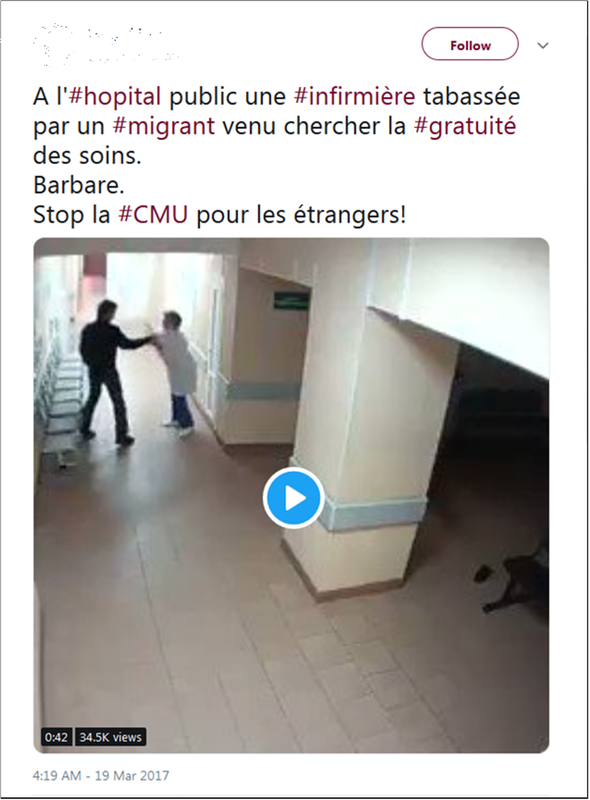 In order not to praise ourselves too much here, we let others have the final word, and conclude with a tweet from @EU_Media_Lit, the official EU account on disinformation and media literacy policy in the EU Commission. 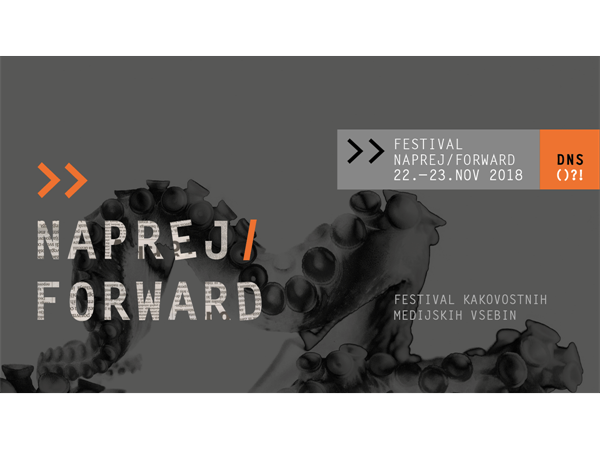 The InVID project and InVID Verification Plugin were presented on Friday, Nov. 23, by Vasileios Mezaris at the 7th media festival Naprej/Forward in Ljubljana. 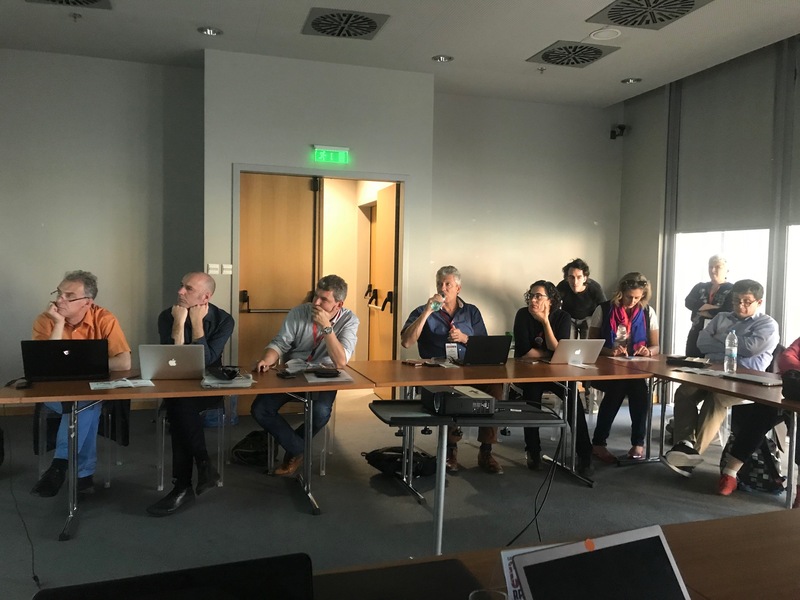 The InVID session was attended primarily by journalists from all over Slovenia, who got to participate in a hands-on demonstration and testing of the InVID Verification Plugin. 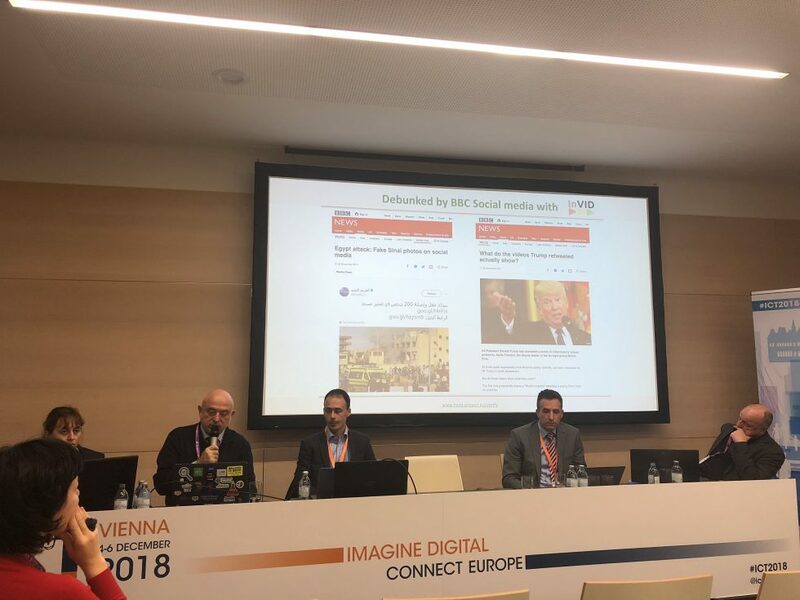 The InVID session was hosted at the EU House: the offices of the European Commission Representation and the information office of the European Parliament in Slovenia. More details (in Slovenian) about this presentation, can be found here. 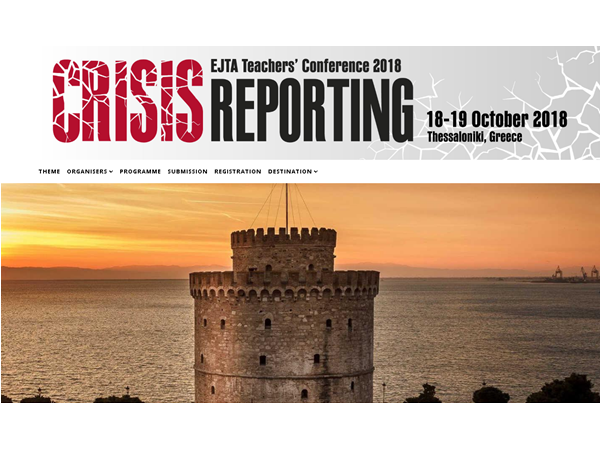 The InVID technologies for newsworthy content discovery and verification were presented by the CERTH team at the EJTA Teacher’s Conference 2018, that took place in Thessaloniki, Greece, on 18-19 of October 2018. 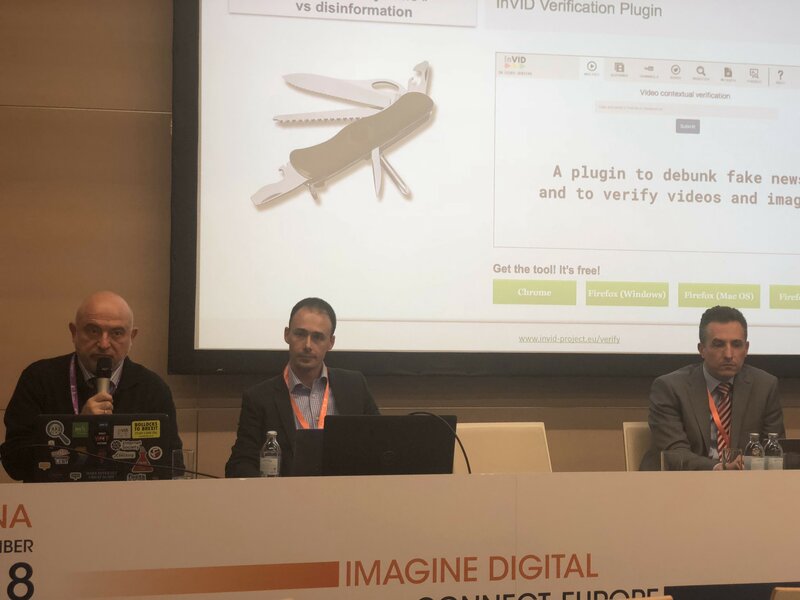 The different components of the InVID Verification Plugin for online debunking of fake videos, were demonstrated during a hands-on session. This session started by a short introductory presentation made by Dr. Vasileios Mezaris (the InVID Project Co-ordinator). This presentation aimed to discuss the motivation behind the project (i.e. 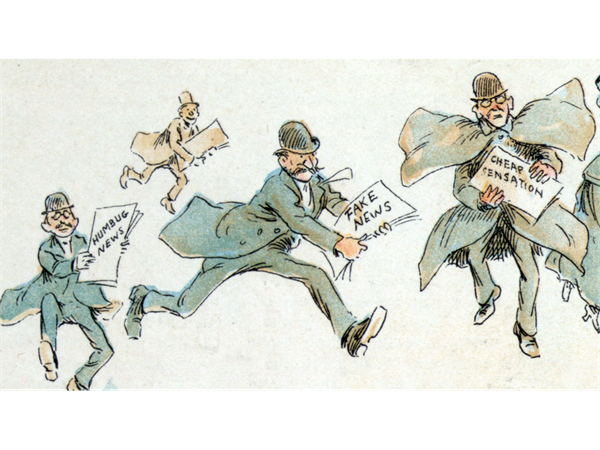 the ever-growing need for quickly identifying and stopping the spread of fake news! 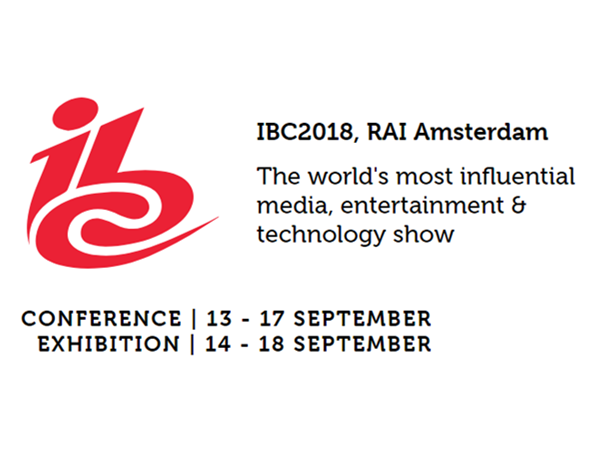 ), the goals of the project and the integrated technologies that have been developed, to assisting journalists and media professionals in collecting, discovering and verifying newsworthy user-generated content. The participants of this session, more than 15 academics and teachers from Schools of Mass Media and Journalism from European universities, had the opportunity to follow a step-by-step procedure for installing the plugin, and using it in a number of fake news debunking examples, based on the different verification components of the plugin. The collected feedback regarding the functionality of the InVID Verification Plugin was highly possitive, while the demonstrated examples in comparison with the free access to the InVID plugin were highly valued as a source that will enable the participants to enrich their courses with some real-life scenarios of fake news debunking using a state-of-the-art video verification technology. 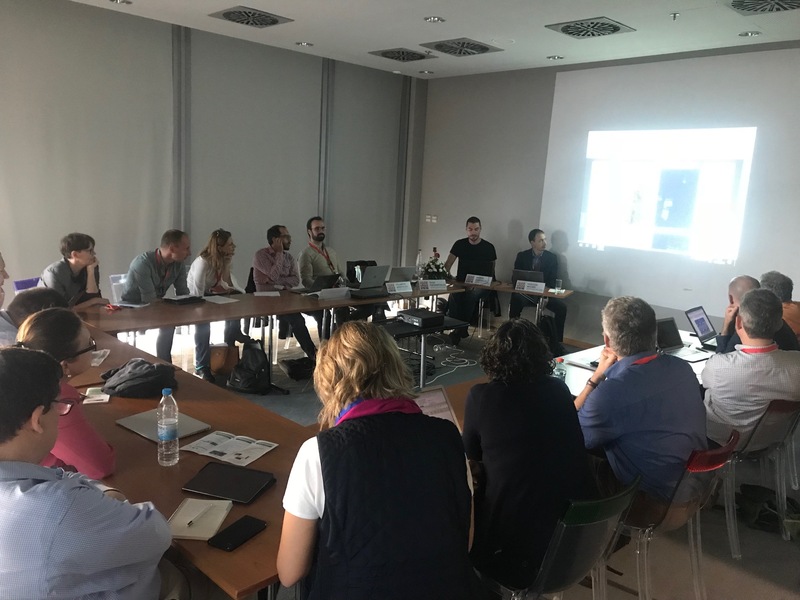 Academics and teachers from Schools of Journalism arround Europe, being presented the verification functionalities of the InVID plugin. Dr. Zampoglou (CERTH) demonstrating the analysis capabilities of the image forensic component that is integrated into the InVID plugin.